Create a VS package with VS 2010, with at least one command, so a .vsct file (Visual Studio Command Table) is created. When you click OK, you get this strange error: “The process cannot access the file ‘VSPackage1.vsct’ because it is being used by another process”. Interestingly, the problem doesn’t happen if you migrate first the VS Package project from VS 2010 to VS 2012, and then from VS 2012 to VS 2015 (I cannot test with VS 2013 because I cannot install the VS 2013 SDK on Windows 10). 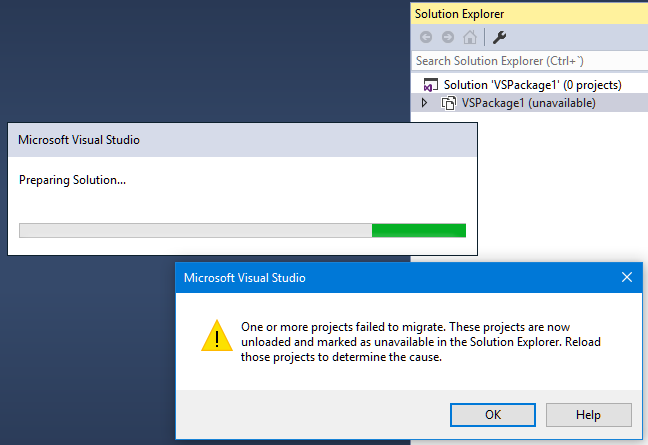 It doesn’t happen either if you create the package with VS 2012 and you migrate it to VS 2015. As I said, I saw this problem for the first time long time ago (I think last year), migrating my own MZ-Tools package. I don’t remember how I solved it, but likely I created a new package with VS 2012 or VS 2013. This week I received an email about converting the DAX editor for SQL Server, which is VS 2010-based, and whose code is available on CodePlex, to support SQL Server 2016. My first suggestion was to convert the VS package project to VS 2015. When I tried it, I got the error about .vsct file in use by another project. And this time I was decided to investigate the cause. 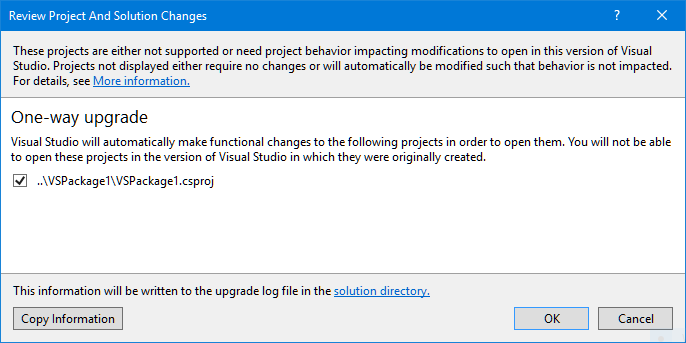 First, I tried to guess which was the other process that was preventing the Visual Studio process (devenv.exe) to migrate the project. Using Process Monitor or Process Explorer didn’t show any suspect. Being involved the .vsct file, my main suspect was the VS Command Table compiler (vsct.exe) but I couldn’t verify, and I was not sure if that VSCT compiler was involved in the migration phase (definitely it’s involved in the build phase). Second, I compared patiently each line of the .csproj of the migrated package project with the .csproj of my own MZ-Tools package, removing or changing lines until both were virtually identical. Still the error. Third, while the error was still shown, I tried to edit the .vsct file with a text editor and save it (successfully) and even rename the file (also successfully), so apparently the .vsct file was not in use at all. So, Microsoft knew about that problem in VS 2012, likely VS 2013 doesn’t suffer the problem either because the package wizard is the same, but somehow they forgot in VS 2015, which uses a different package wizard. It remains to be explained why the error message is so misleading but my patience with this issue is depleted and now that I know the solution and it’s documented here for other VSX developers I am more than satisfied. I have noticed today that VS 2010 macros stopped working. When I thought that I have fixed the bug that I explained in my last post, I found another subtle one: in VS 2010 and 2012, setting to False the Visible property of a CommandBarPopup was not honored if the CommandBarPopup was created on a context menu (for example, in the Code Window context menu), but it worked if created on a Toolbar (for example, the Standard toolbar). This is another bug introduced in the WPF-based commandbars of VS 2010, since it works as expected in VS 2008 and before. Unfortunately I was unable to detect these two bugs back in 2009 during the VS 2010 beta since MZ-Tools 6.0 did not offer the more complete customization offered by the new MZ-Tools 7.0 version to show / hide buttons and dropdown menus. But fortunately, the workaround is as easy as adding the children CommandBarButtons before setting the Visible property to False. BUG: Setting CommandBarPopup.Visible to False doesn’t work when CommandBarPopup in context menu. A couple of days ago a customer of the new version MZ-Tools 7.0 for Visual Studio reported a bug regarding the dropdown menus visibility not preserved across Visual Studio sessions. I isolated the bug which happened to be a bug in the WPF-based commandbars of Visual Studio 2010 (and 2012), not happening in VS 2008 and before. BUG: CommandbarPopup.Caption changes CommandbarPopup.CommandBar.Name and viceversa. My MZ-Tools add-in was experiencing a random “System.Runtime.InteropServices.COMException (0x80004005): Error HRESULT E_FAIL has been returned from a call to a COM component.” when using the EnvDTE.DTE.ActiveSolutionProjects property that I knew that other developer reported in the MSDN VSX Forum in January. Today I tested a guess of Ryan Molden (from Microsoft) in his answer about a dependency on the visibility of the Solution Explorer and he was right. So, in VS 2010 the problem happens when one condition is met: The Solution Explorer is not shown. Service Pack 1 of Visual Studio 2010 introduced a bug when debugging add-ins in VS 2010 targeting .NET Framework 2.0 that I blogged about back in March. They were kind enough to contact me some months ago to try a private hotfix (which was successful) and yesterday they made it public. I mentioned in my last post that the MSDN documentation for Visual Studio uses a mechanism in the URL to reference several versions of Visual Studio. I noticed that the Community Content at the bottom of each documentation page doesn’t propagate from one documentation version to the next one, with good criteria I guess because maybe the content is not relevant in the next version. So, although long overdue too, I have entered today the community content for MSDN VS 2010 documentation that I entered in Sep 2008 for Visual Studio 2008 since all of it is relevant. It has been dozens of blocks with references to articles of the MZ-Tools Article Series. After a couple of (wasted) hours, I think that both Visual Studio 2010 installations are working again, without SP1.